We have written extensively at Tsarizm about Russia’s new role of arbiter she is now playing in the Middle East, attempting to prevent all-out conflict between Israel, Syria, Hezbollah, and Iran. 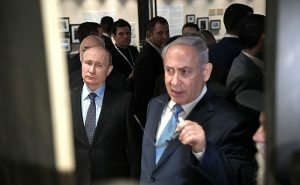 Israeli Prime Minister Netanyahu flew to Moscow recently, as he has done many times before since Russia landed an expeditionary force in the Levant, and seems to have come home with a pledge from Russian President Vladimir Putin not to sell Russia’s client state, Syria, more advanced air defense weapon systems than they already have. Russian Foreign Minister Sergey Lavrov stated on April 16 that Russia was ready to consider all necessary steps to reinforce Syria’s defense capabilities, including the delivery of the S-300 systems, added TASS. It would not be in Russia’s interests to facilitate a hot-war conflict between Israel and the Assad regime. The Kremlin has just spent a lot of blood, treasure, and geopolitical capital on shoring up the Shia junta. Israel would most certainly decimate the Syrian military if unleashed. One wonders what Putin received in return for refusing to enable the shooting down of Jewish pilots in the Levant.